How to deploy / embed your landing pages on your own website. Landing Cube comes with the ability to deploy your pages on your own site through the use of an interactive frame embed code, or “iframe” for short. Using an iframe is a really great way to ensure functionality of your landing pages, no matter where they are. When using an iframe, you create an interactive window to the content, meaning any interactions are still handled by the original host. This means your signups, promo codes, customer data, etc. will all continue to work as expected, because your viewers are still accessing the landing page on our servers, but viewing it on your webpage. You may already be familiar with iframe embed codes. If you’ve ever used the “embed code” for a youtube video to showcase it on your own site, that’s an iframe. And just like when using theirs, all functionality will work through that interactive frame. Once your landing page is published, your iframe embed code will be available in the Dashboard. From the additional options, select "Publish"
To publish your page with the embed code, all you need to do is copy and paste this code into your webpage's HTML. (Or if you are using a CMS, like WordPress, place it into any HTML capable field you want your landing page to appear). If you use WordPress, simply paste your code snippet into the page editor. Same for Shopify – simply paste the script into your page editor. Your landing page will be nested between your website’s header and footer. Alternatively you can download our plugin for WordPress. 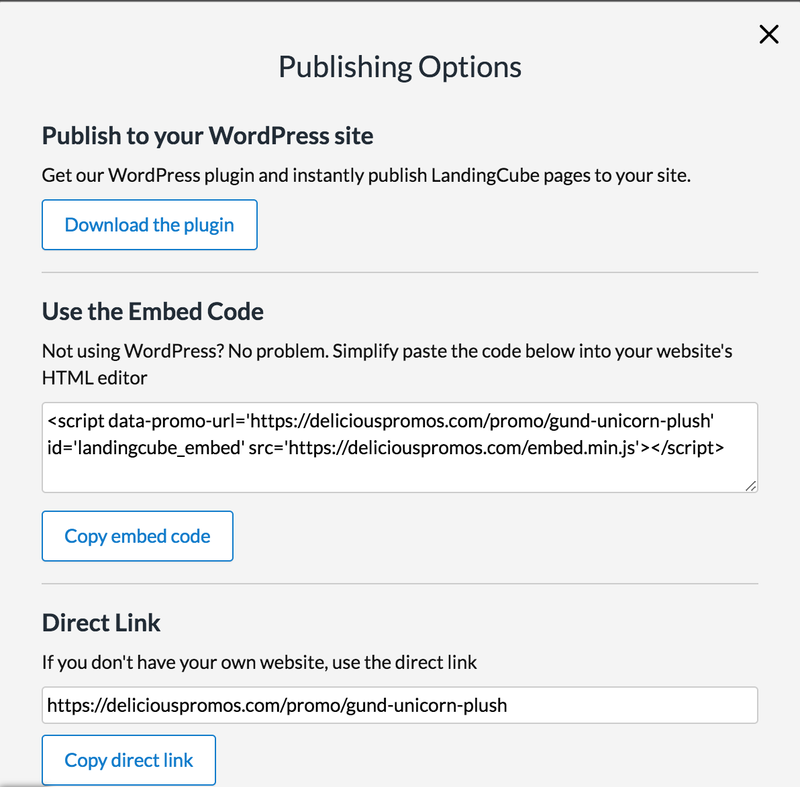 See this article for detailed steps on how to download and use the LandingCube WordPress plugin. And that’s all there is to deploying your landing pages on your own site.